If you are fortunate enough to have dental insurance, then this is a great time to take a look at your benefits for the New Year. Dentists in Fairbanks recommend that you get familiar with your insurance coverage and avoid waiting until the end of the year to use them. Did your benefit year start on January 1? Most dental plans begin on the first of the year and end on the December 31. That means that most patients will be able to take advantage of a new annual maximum benefit, dental checkups, x-rays, and dental cleanings. If you met or exceeded your maximum benefits for last year, the New Year is a chance for a fresh start! Did you fund your health savings account last year? If so, those funds should be available for you to use this year. Think about using those funds to offset the dental expenses that may not be fully covered by your dental insurance, such as power toothbrushes, braces, teeth whitening, deep cleanings, or dental crowns. Do you need extensive dental treatments? Sometimes, getting your dental health back on track can be a lengthy and costly process. Check your benefits now and talk with the dentist about prioritizing your needs so that you can maximize your insurance coverage throughout the year. If you know that you will incur some out-of-pocket expenses, get started now to allow time for proper budgeting and scheduling. Did you wait too late last year? You’ll have 365 days to use your benefits, but if you wait until November or December to make your appointment, you could find yourself in trouble. Getting into the dental office becomes more difficult towards the end of the year due to the holidays and the potential for fewer office hours. Also, some procedures such as dental crowns and implants could require several weeks or months to complete. Get started now to avoid the year-end time-crunch. 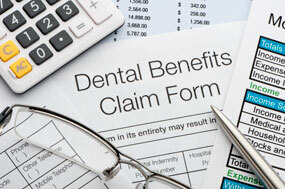 Do you need help understanding how your dental insurance benefits breakdown? Contact a dentist in Fairbanks for help today.